Have you ever wanted to make sure your students are following the class, but don’t have the class time to walk them through every step? HowTheMarketWorks has your back! 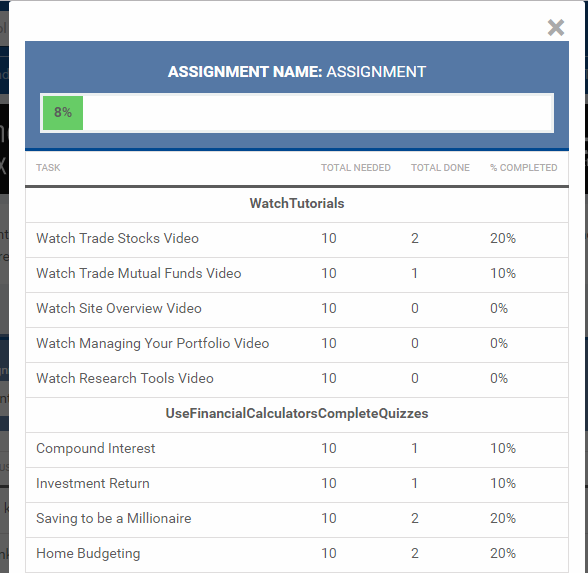 Our Assignments feature makes it easier than ever to keep your personal finance, investing, economics, or social studies class engaged, and keep track of your whole class all in one place! An assignment is a list of tasks that you can add to your contest. 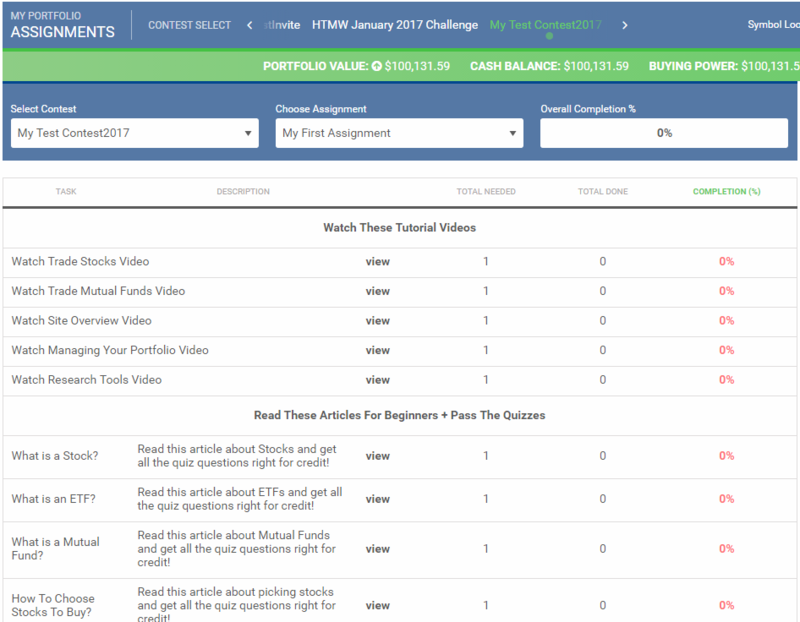 Some of the tasks are purely educational (like reading an article about what a Stock is), some are tutorials on using HowTheMarketWorks (like watching a video on how to trade mutual funds in their virtual portfolio), and some are purely experiential (place 10 stock trades, or use our Compound Interest Calculator to solve a quiz). Regardless of the type of assignment, once you create it, all your student’s progress will appear on your Report Card for this assignment. Your students can see all their tasks (and their own progress) on their “My Portfolio” page. You can also have more than one assignment at a time; each assignment has its own Start Dates and Due Dates – allowing you to create assignments with topics lining up with your lesson plans. If you haven’t already, Click Here to create your own custom stock contest! You can add our recommended assignment right away, or create your own later. What can I add to my class Assignments? Investing Fundamentals – The 10 things that should be in every class. These walk students through basic vocabulary, and some tutorial videos showing how to start building their portfolio. Elementary and Middle School – These are some of our more basic articles for younger students (covering things like fractions or basic usage of spreadsheets). These are also great as a refresher for older students to ensure all students are starting on equal footing. Intermediate Investing Tips – These lessons build on what students would have learned in the Investing Fundamentals. Personal Finance – Activities specific to Personal Finance classes. Includes activities for budgeting, credit, investing, and more. Economics – Activities specific to Economics classes. Includes activities for economic research, supply & demand, and more. Accounting, Management, and Marketing – Our core lessons for high school business classes. Trading – You can also assign your students to make a certain number of trades, or utilize different order types. 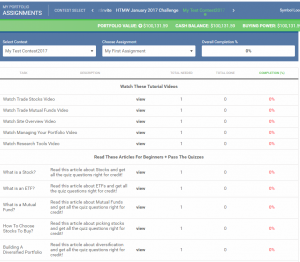 There are 4 types of assignment items that you can find in each category: Articles, Activities, Videos, and Trading. Articles are short articles, between 500 and 2000 words, about specific topics in personal finance, business, and economics. Students are expected to read the article and answer a short 3-5 question quiz at the end (they can re-try the quiz until they get a perfect score). Activities are a lot like articles, but with an interactive activity instead of just reading. These include building a budget, planning on saving $1,000,000 by retirement, buying a car, and more. Videos are tutorials showing students how to use the HTMW website and get started making their first trades. Trading requires your students to make certain types of trades, like buying 10 stocks or using a Limit Order. 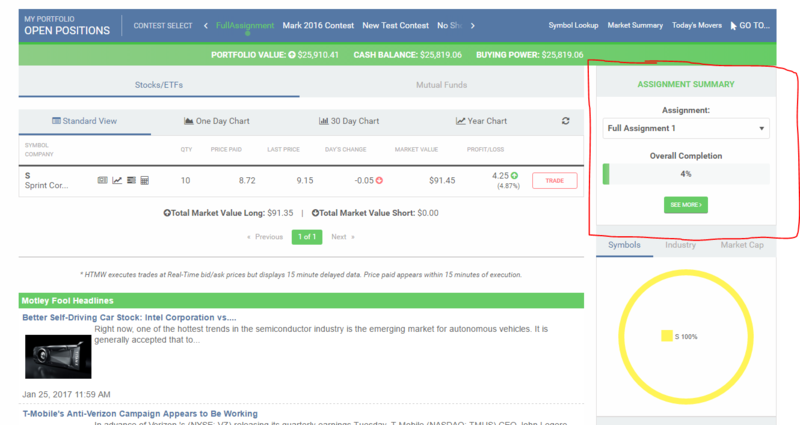 If you would like an answer key with all the questions, answers, and descriptions for the quizzes, please use the live chat on this page, use our Contact Us support form, or send us email (support@howthemarketworks.com) to request it from our support team. We need to verify you are actually a teacher to send you the answer key, but this takes just a few seconds. Great! How do I create an Assignment? On the Manage Assignments page, click “Create New Assignment”. Make sure you have the right class selected! From here, you need to give your assignment a name, then choose which items to include and how many. You can also set the “Start” and “End” dates – your students will only be able to make progress on the assignment between these dates (but you can see their progress even after the end date). We have recommended default values in place based on teacher suggestions, but feel free to tailor your assignment to your class’s needs! How Can My Students Follow Their Progress? How can I track my students’ progress? You can also export your entire class’s progress to Excel. What if I want to have my students do different assignments throughout the semester? You can create as many new assignments as you want in the same contest! Just create a new assignment and give it a new name, and it will start tracking a whole new set of tasks! This way you can have your students read some articles, watch some videos, and place a few trades one week, then read different articles, use some calculators, and place more trades the next week. If you have more than one assignment active at a time, your students can switch between them at the progress bar on the right side of each page. 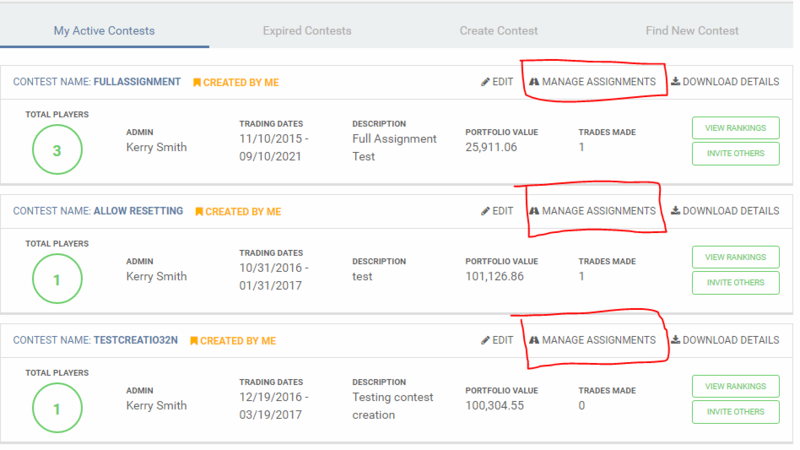 Note: If you have more than one contest active at a time, your students’ actions will only save to their active assignment (the one they have set on their Open Positions page). This means that no actions will count for 2 assignments at once. Can I remove an Assignment? Make sure that you have the correct assignment selected, then click “Remove Assignment” at the bottom of the page. Once an assignment has been removed, it cannot be recovered. This means that the report card and all students’ progress will be lost, so make note of it before removing an assignment.